Ancient Terrible Things: SkullPips is a dice upgrade pack for the pulp horror dice game, Ancient Terrible Things. 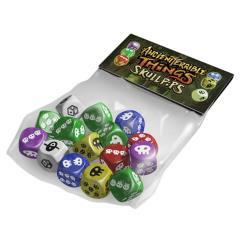 The upgrade pack includes a full set of custom SkullPip dice for use with Ancient Terrible Things and Ancient Terrible Things: The Lost Charter expansion. Additionally, the custom pip dice can be used to customize any 6-sided dice game.